Electronic BrainBox is a great introduction to the world of advanced electronics. 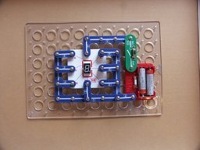 With this kit kids will learn how to build exciting electronic experiments – safely and easily. The parts are plug and play with no tools or soldering required. Students quickly learn how to use electronics to create lights, motors, burglar alarms, radios and much more. Electronic Brainbox, Hot Wires or Snap Circuits kits can all be used to build the circuits given here and can be purchased online or at toy stores nationwide so you can be an engineer anytime at home or at school. Alternatively, Cork Electronics Industry Association annually sponsors workshops during Science Week, as part of Cork’s Discovery Science Festival, and at Blackrock Castle Observatory during Engineers Week. The workshops are most suitable for children 10 to 12 years of age and are free but pre-booking is essential at Blackrock Castle Observatory as spaces are limited. Booking details can be found on www.engineersweek.ie.